Manhattan views complemented by satisfying drinks and food at this rooftop lounge. Lunch & Dinner daily, Brunch Sat. 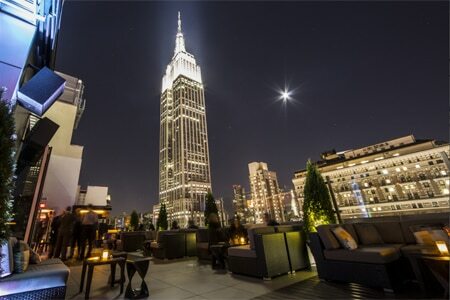 : Eighteen floors above Herald Square, Monarch Rooftop & Indoor Lounge boasts spectacular views of the Empire State Building and Midtown Manhattan in a swanky room with plush couches and low velvet chairs. Signature cocktails like the Monarch Moon (raspberry moonshine, dry vermouth, aromatic bitters and grapefruit juice) seem to go down smoother when looking across the skyline spiked with glass skyscrapers. Peruse a short list of wines by the glass and bottle, the latter featuring options from California, Chile and New Zealand. 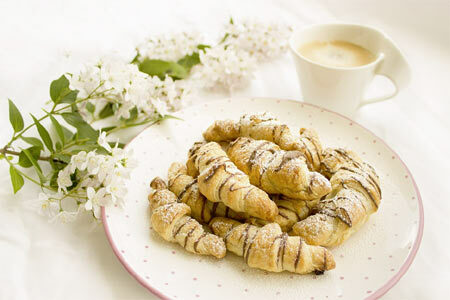 The food menu consists of shareable finger foods and flatbreads --- it's primarily meant to complement the beverages --- but what's offered usually does the trick. Shrimp ceviche and handmade empanadas are a bonus to a night out imbibing cocktails. Avocado toast is unremarkable, but chicken wings are crunchy on the outside and tender inside. In warm weather, grabbing a seat on the large outdoor deck is imperative.